This blog post is a continuation from a previous post on the Finger Lakes Cheese Trail. 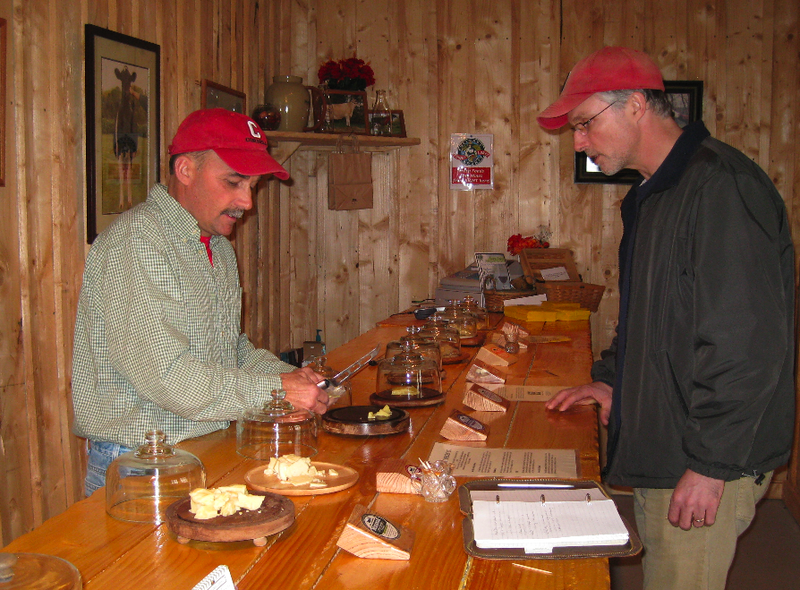 While traveling the Finger Lakes Cheese Trail we met Tom Murray of the Muranda Cheese Company. Muranda makes 13 different kinds of raw milk cheese. Raw milk cheese is made from unpasteurized milk. Unpasteurized milk has bacteria in it, which contributes to greater flavor. All of their cheese is produced from milk that is produced by cows living on the farm. A single source of milk is good because you can produce consistent levels of butterfat and protein. 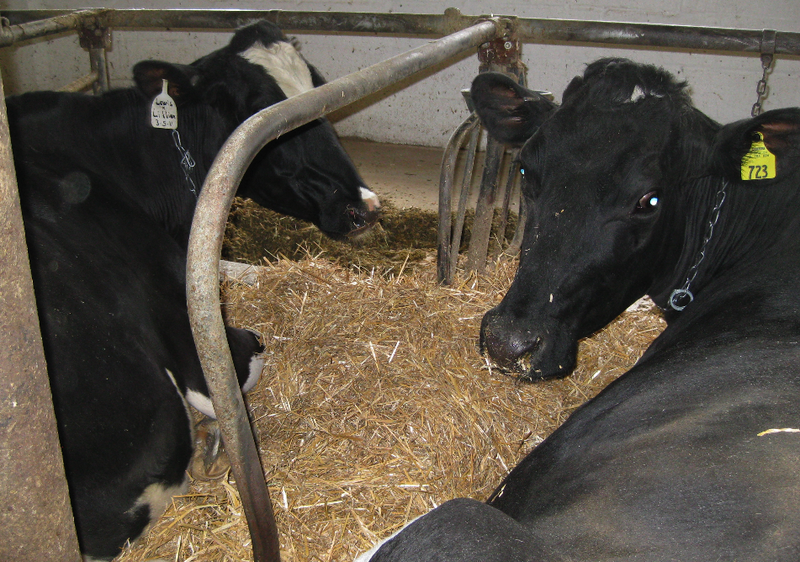 April – November the cows are grass fed, the rest of the year they are in the barn. Why is this place known as “Muranda?” Its not Tom’s last name, but in fact it’s the name of their world famous cow, “Muranda Oscar Lucinda,” who was #1 in the world for milk production, and has produced an entire line of other famous milk producing Murandas. 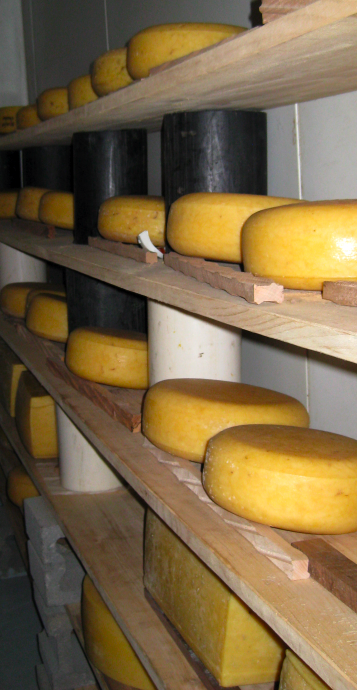 All cheese is aged on site, in the “Cheese Cave.” The Cave contains 6 ½ tons of cheese. There is a 3-year old cheddar still aging, and their youngest cheese is 120 days (A Colby). Each wheel is hand painted with a breathable wax. A wheel loses 3 lbs. of moisture while aging. This winter they made 1,300 lbs. of cheese every week. This is the 4th year they have been in business and Tom says it started as a hobby, but quickly became a business as the Cheese Trail grew in visibility. We were able to taste all the cheese varieties and I loved them all, but we each purchased a different cheddar when it came time to bring some home. Muranda makes a delightful British Cheddar that starts out sweet and finishes sharp. After we toured the cheese cave, Tom took us out to his barn to meet the cows. What is the secret to a top-producing cow? “Boredom” says Tom. Anxious cows do not produce rich milk in massive quantities. Bored cows are happy cows. These are the happiest cows I have ever met. When you walk into the barn, they don’t jump up and moo. In fact they do nothing at all. They are so busy chewing; they don’t even notice that you are there. Tom buys only top quality forage and feed his cows a ration of 75% forage, 25% grain. In order to eat that much forage, cows have to spend a LOT of time chewing. In fact, Tom will tell you that the sign of a healthy happy cow is 60 chews before she swallows. Remember that cows have 4 stomachs, so they do a lot of magical milk formation by digesting all that grass and forage. If they are not chewing at least 60x between swallows, you may have a sick cow! Cows that eat a lot of grain are eating too fast, and as a result are jumpy. We saw very, very bored cows occupying themselves by noisily chewing in a barn that smelled a lot better than my 16-year-old son’s room. In fact it did not smell at all. That is because the ventilation system recycles the air in this barn every 8 seconds — to make sure that the cows are breathing fresh air and thereby making better milk. The barn has a conveyor belt manure system operating twice a day, to keep the barn floor clean AND Tom washes his cow’s tails every day. “Animal Husbandry involves a lot more manual labor than it does computer skills,” says Tom. The other secret to a top-producing cow is genetics, and Tom is an expert. Only 2% of dairy farms practice genetic breeding. Tom breeds all his animals for high milk production, high protein and longevity. His farm has the top 1% of milk producers. Nowadays they use genotyping to determine if the cow is a million-dollar baby. This calf is worth $20-25,000! Tom owns the #2 bull stud for milk production. He lives off-site. 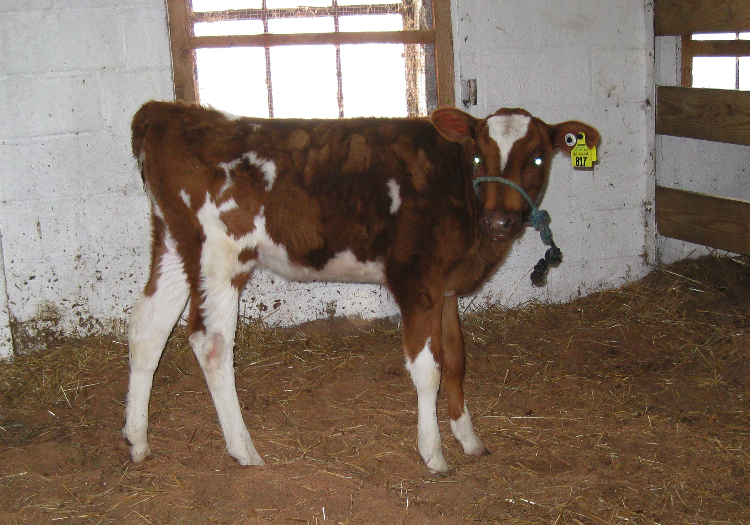 Inside his barn, he introduced us to a bright red calf that he said was the only one of its kind in the world. The calf was headed for auction where he expected it to fetch between $20-25k! A world record producing cow will produce about 218lbs of milk a day. 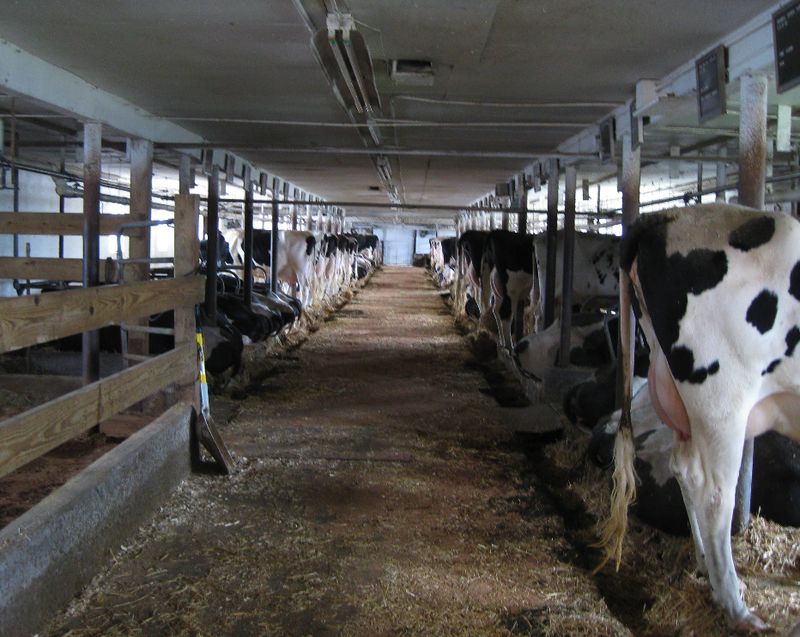 Average cows will produce 140lbs and that’s about 2x what an anxious cow will produce. That’s if they get the 90 gallons of water they need each day. Milk right out of the cow is 86 degrees. Tom has to cool it, store it and transport it to his Cheese maker, Bob Switzer, from the Cooperstown Cheese Company. Two days a month he devotes to making cheese for Muranda. This year he will be debuting an Asiago just in time for Christmas. You can buy Muranda at 80 wineries, 22 restaurants and 9 stores. In Rochester you can find it at Abundance Co-op and Red Bird in Fairport. Entry filed under: Activities, Cayuga Lake, Cheese, Finger Lakes, Retail, Rochester, Seneca Lake, Wineries. Tags: Cayuga Lake, finger lakes, New York, Seneca Lake, upstate new york, Wineries. Wow! Coupled with the video posted on your original post, this blog is a phenomenal description of the “Happy Cows at the Muranda Cheese Company” and a real marketing piece for Muranda should they feel so inclined. Great work Barb!! I want some of their cheese – right now! That was so interesting! I want to go visit those happy cows — and eat some of their happy cheese!